The Holiday Inn Key Largo, could be the perfect base for you to explore the Upper Keys and Key Largo. Yes you might have stayed at a thousand Holiday Inns across the world. But this resort in Key Largo is really different. Well it is compared to some of the holiday inns that I have stayed at. I really liked my two days as a resident. So lets start with letting you know where the Holiday Inn Key Largo is to be found? Well surprise, surprise, the resort is in Key Largo which is the most northerly of all the Florida Keys islands. Many people fly past Key Largo such is the desire to get as far down the islands as possible. Generally all the way down to Key West. But Key Largo has a lot to offer, a bit like this resort at Mile Marker 100 down the Overseas Highway or US1. 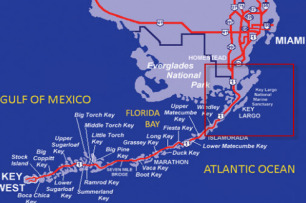 Just to give you an idea if you have never visited the Florida Keys before, the Mile Markers run down to 0 going South, and up to 127 at Florida City on the mainland if you are going Northerly, and are small signs by the side of the roadside. So you won’t get lost find the Holiday Inn Key Largo, or at least I would find it hard to imagine you doing so. If you were travelling from Miami International Airport, which is the largest of the airports in the area, then you will be looking at a journey of about 55 minutes or so. What Type Of Amenities Do They Have? The Holiday Inn Key Largo Resort and Marina has many of the things that you would expect to find at one of their resorts, but of course being in the Florida Keys you will have perfect weather too. The resort has two large swimming pools, one that actually has a waterfall flowing into it which gives it a nice tropical feel. So dip your feet in the water, reach over to the refreshing rum runner cocktail served at the onsite Tiki Bar, and you will without a doubt experience the Florida Keys as it should be experienced. But maybe the thought of staying at the Holiday Inn Key Largo and just relaxing whilst you work on your tan leaves you feeling a bit cold. Well if you are feeling energetic, then you can make your way over the to the exercise room, to get the blood pumping as you work out on the top of the range cardio-vascular equipment. Oh, and did we tell you that you can then use the Jacuzzi afterwards…..go on you know you want to really. What Are The Rooms Like at The Holiday Inn Key Largo? The resort has more than 130 rooms, that have been designed with a subtle and tasteful tropical theme. So most of the bedding and pictures will have fish, plants and animals within the patterns. The walls are in mild pastel colours that really fit in well, as you lay on your bed watching the television, whilst glancing out of your balcony at Key Largo spreading out in front of you. If you really want a good look at Key Largo, then make sure that you ask to stay in one of the harborside rooms, that overlook the marina and fishing village on the ocean side of Key Largo. What Is There To Do In Key Largo Generally? Key Largo is known as the Diving Capital of the world, so you can be sure that a lot of the attractions and activities will be based around the water of Key Largo. Just up the road is the world famous John Pennekamp Park, which I guess is the biggest attraction in the area, especially if you like to strap a tank on your back and do a bit of diving. 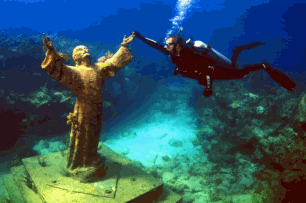 John Pennekamp was the first underwater national state park, and since the 1960s has been luring eager participants to the are, to explore the only living coral reef in America, and to shake hands with Christ of the Abyss. So once you have visited the national park, you will have the fun of Homestead International Speedway, Key Gate Championship Golf Course, and of course myriad of boat charters ready for hire. The experienced Captains will be able to take you out for marlin, tun, dolphin and other catched synonymous with the Florida Keys.